Technology tools are not just for Techies! What is eEdge on the Go? Put simply it is our myKW eEdge section optimized for your mobile device. Does not matter if you are using an iPhone or Android or any other smart phone, it will WORK!! Since I’m an iPhone user, these directions and pictures are going to be for an iPhone, and other than the app you use to surf the web, they will be the same. Start by going into your web search app, like Safari, then in the address bar, type mykw.kw.com and “go”. This will take you to the login screen and enter your myKW login and password and type “login”. Quick iPhone/iPad Tip: Once logged in, before you click on anything else, tap on the square with the arrow button and you will see a middle button showing “kw e” and below it says “Add to Home Screen”. Once you tap on it, it will create an icon on your phone that all you need to do is tap on the button to get into your eEdge on the Go. Now that you are logged in, you will see 6 squares. If you scroll your screen up to see the bottom, that is where you can switch market centers if you need to or click on the “myKW Full Site” if you don’t want the mobile version. myLeads: This icon shows your number of leads in the top left corner. When you tap on it, it will take you into another screen with New Contacts, New Messages (your eEdge messages), Search Contacts and Reminders. Below that also lists eEdge on the Go! (back to the home screen), Add Contact or Go to Full Version. This article is not about how to use each part of the system, so we are just going over the buttons. myContacts: This button takes you to Search Contacts. Enter the name, status, type, group, phone number or email and then tap the “search” at the bottom right. To go back click on the top left corner. 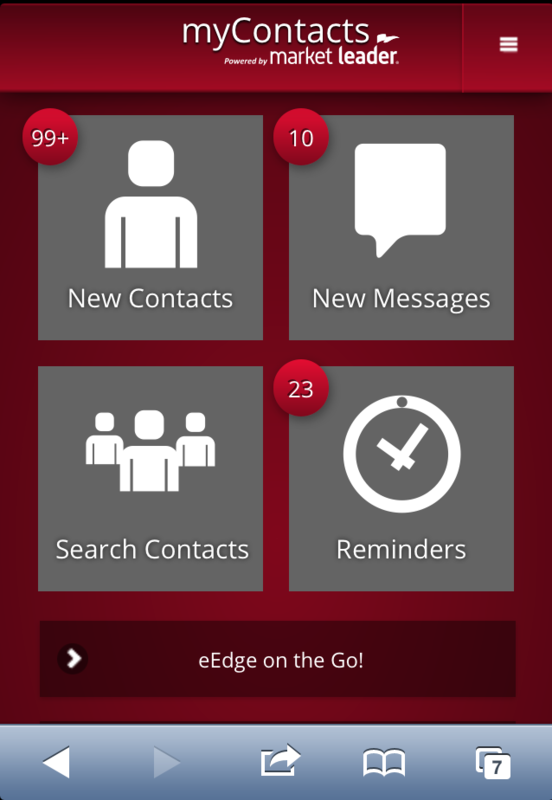 Contact Messages: Straight into your eEdge messages!! No more need to log into the system on a computer to check your eEdge mail! Just tap on one of the messages and you will have the option for “file” or “reply”. myActionPlans Tasks: This icon will open in a new window. 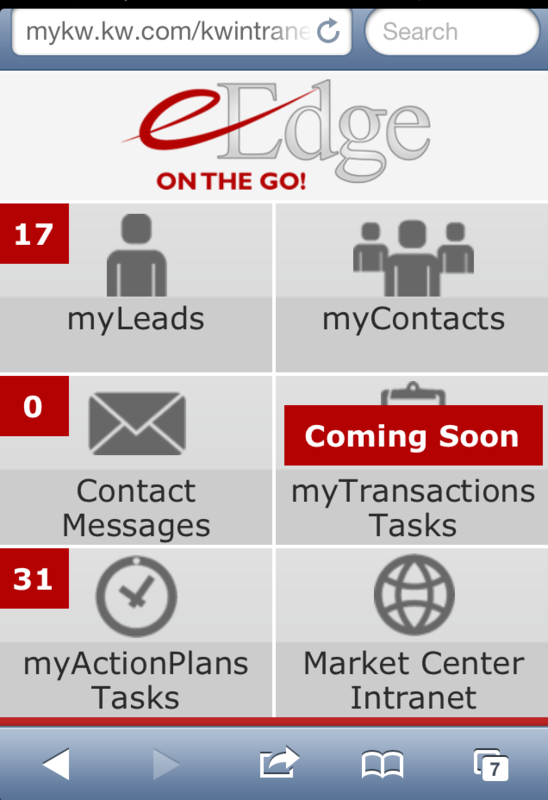 It looks like the myActionPlans in your myKW, but it is also mobile optimized. In order to go back to eEdge on the Go, you will need to tap on the bottom right button with a number in it (number of windows open). Then scroll to the left (or right) to find the window with eEdge on the Go on it. Market Center Intranet: If you are in a business center, you will need to switch to your main market center for this to work. It will show you all the features of the intranet, just in a scaled down and simple version. The pictures will not display on posts however you can tap on the link or title and it will expand. You can not create a post from the mobile version, but you can most certainly make a comment on an existing post. The cool part is the calendar shows at the top under the menu and are easy to read. This one also opens in a new window, so you will have to go back to the previous to get to the main menu. myTransactions Tasks: Coming Soon! When the new myTransactions 2.0 comes out, you will be able to access your myTransactions/DotLoop Account, can’t wait!!! There you have it, eEdge on the GO! A new tool to use for your business so try it out today! I can be reached at Carolynt@kw.com, by phone or text at 918-951-9020 or visit my website at www.SearchTulsaHouses.com. Now you have a campaign going and you want to add a client. There are a few ways to do this, but the simplest for a single or just a few clients is to do them individually. 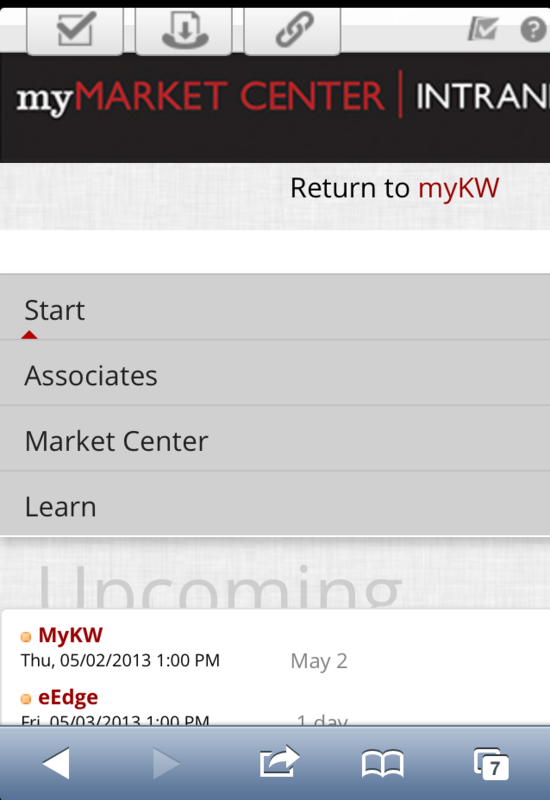 First, sign into your myKW.KW.com and click on “View Contacts” in your eEdge dashboard. Search for and click on the name of the client you want to add to the campaign. Scroll down to the bottom of the contact’s information until you see the grey “Campaigns” and next to that is the blue “Add Contact to a Campaign”. Once you click on this a new window will pop-up and show your campaigns that you have created. Check the box next to the campaign you want to add them to and then click “Add to Campaigns”. If you click on the “Campaigns” link, it will show you the campaigns this client is attached to. This is also where you remove them from a campaign. Click to check the box next to the campaign you want to remove them from and then click “Remove from Campaign”. The second way to add them to a campaign is to go into the myMarketing section. From you myKW.KW.com home page, click on the “+” next to myMarketing and “Create and Manage Campaigns”. This will take you to your campaign dashboard. Click on the little gear next to the campaign that you want to add some one to and it will give you a drop-down of options. Select “Add/Remove Contacts” and it will pull up the list of all of your contacts on the left and the contacts in the campaign on the right. Add (or remove) the clients that you want from that campaign and then “Return to Campaigns Home”. I have a New Lead in myContacts, now what? Our Keller Williams eEdge websites are designed to be lead capturing websites. In case you are wondering lead capturing means that it is set up so that when a customer goes to your website and clicks on properties, they can view the details of 1 property and then when they go to the 2nd property, it prompts the customer need to enter their first name, last name and email address. This “captures” the customer’s information and adds into your database (myContacts). One of the best things about eEdge is that each piece of this real estate pie is connected so when a customer registers on your website, they are also added to your database. Ok, so the customer has registered on your website and is now in your myContacts so that you can market to them and with cultivation, also into a transaction. With your new lead, when you click on their name from your “New Lead” link on your myKW home screen. This takes you to the dashboard and shows the names of the new leads that have come in. Before clicking on the lead, you will see some icons below the name. The House with the arrow indicates that the customer has set up a search for homes (listing alert). If you hold your curser over the icons it will give you a description. The Green dollar sign means that the customer needs to get mortgage approved. In other words, send their information to a lender to get approved and/or send them a few lenders to contact. The Picture of the cell phone indicates that the customer has given you their number, which means you NEED TO CALL them!! Last and certainly not one you want is the envelope with the red X which indicates the email address is invalid (not working). Choose a new lead by clicking on their name. This will open up the contact details and show you their average price, number of houses they have viewed and saved along with a few other things. By scrolling down tot he bottom and looking at the emails the system has sent the customer on your behalf. This also shows the welcome email with the customer’s password. If you do not have pro, this is a way to log into your own website as the customer and see the listings that they have viewed and saved. If you call them or send an email that is from your person email address, you can add a comment about your conversation or note you sent them. This is a great way to keep track of your communication with your customers. Now it’s time to try it… Sign into your myKW and start working your leads! !